I wanted to read this book the moment I found out about it. I feel a special affinity for books about the magic of books and reading. It sounded like the perfect blend of fantasy, magic and adventure – and in a magical library with talking cats, no less! I expected to like it. I wanted to like it. When Alice’s father goes down in a shipwreck, she is sent to live with an uncle she’s never heard of and knows nothing about. Her uncle turns out to be a mysterious old man with an impossibly massive library full of books she is forbidden to read. But when she runs into a talking cat her whole world is turned upside down. It took me more than three-fourths of the book to even get into it at all. Until then, it was a struggle. I understand that Wexler was building the foundation of the story but there were many painfully slow parts. I’m afraid it won’t hold the attention of the intended middle school readers. It had all the right ingredients, but it lacked something… I wasn’t sure what it was missing but then it hit me. This book has exactly one long, slow plot. There are books that work on various layers, with subplots and secondary characters with their own lives, with people who have histories, people who have more than one interest. This book does not. It’s not a tree with branches going off, branches of secondary plot points or action outside the main narrative thread. It’s completely about Alice going from point A to point B, with some stops along the way but never, ever branching off, doing anything that isn’t directly plot-relevant. There’s not a single character she meets that is anything but a plot-relevant prop, there to either hinder her or help her. I didn’t really get the impression of any of those characters as real people with lives outside of Alice’s plot. Whenever those characters weren’t needed, they were just put aside on a shelf, waiting for the next time they’d need to turn up. It did end on a strong note and I might be curious to check out book two, after I finish my mountain to read, but I won’t be running out to get the second book anytime soon. 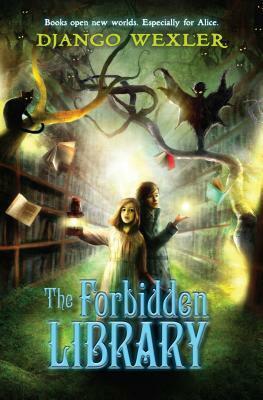 This entry was posted in Children, Fantasy, Magic and tagged Django Wexler, Middle grade reader, The Forbidden Library. Bookmark the permalink.